Open Heaven [19 May 2018] A Child of Abraham? - Open Heavens Daily Devotional Messages, By Pastor E.A Adeboye. Open Heaven 19 May 2018 A Child of Abraham? The fulfillment of these words in the lives of Abraham’s direct descendants (the Jews) and in the lives of Christians, who are partakers of these promises by adoption, has resulted in a situation where people from all nations of the world seek to be numbered among Abraham’s children. 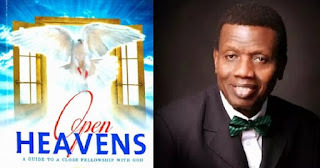 Open Heaven 19 May 2018: [Saturday] Daily Devotional By Pastor E. A. Adeboye - A Child of Abraham? You can therefore see that it is only men and women of faith that are true children of Abraham, and so only they are recipients of Abraham’s blessings. In other words, faith is what qualifies a person to inherit Abraham’s blessings. Are you truly one of Abraham’s children? The word of God in Galatians 3:6-9 tells us that irrespective of whether you are a Jew or a Gentile, rich or poor, male or female, white, black or brown, old and young, you can become one of Abraham’s children and gain access to the blessings promised to them if only you live by faith. Some may ignore or reject this truth because they have no idea what it means to be a child of Abraham, or because they see no value in the awesome blessings promised to Abraham’s children. This attitude is not surprising, because the things of the Spirit of God are foolishness to the ordinary person (1st Corinthians 2:14). I pray that the Lord will open your eyes to the truth of His word so that you can gain access to all of your inheritance in God in the mighty Name of Jesus. Father, impart my spirit with Faith to appropriate all of my blessings in You in Jesus’ Name. Open Heaven 19 May 2018: [Saturday] Daily Devotional By Pastor E. A. Adeboye A Child of Abraham? Labels: Open Heaven 19 May 2018: [Saturday] Daily Devotional By Pastor E. A. Adeboye A Child of Abraham?